Geri Moran. Making it simple. Getting it done. Are you are drowning in To Do lists and stacks of paper? Call Geri to help you get the right system in place, get it all done, and move forward. Do you need a process simplified, a procedure or software system documented, or assistance with a special project? Geri’s expertise will save you time. 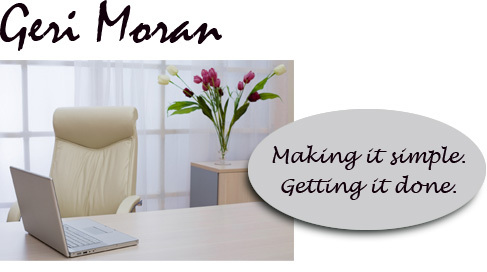 Geri Moran is an entrepreneur, technical writer, and software specialist, with a work history in corporate management, business analysis, and management consulting. She enjoys being a resource for the growing number of individuals who are finding they can’t, or don’t want to do it all themselves and finds personal satisfaction in easing the load for others. After years of corporate and retail experience, Geri started her business in 1993 as Emerald Marketing Services. She saw that many small businesses, entrepreneurs and harried individuals had a need for a highly skilled resource that they could call upon as needed, and she set out to fill that gap. Whether you need help for one special project, or on an ongoing basis, you get reliable, affordable assistance from someone with a broad skill set, a reputation for integrity. and a love of all things paper and process. You don’t have to do it all yourself. That’s why God invented other people. © Geri Moran 2009. All rights reserved. Save yourself time, money and aggravation by having a paperflow system that works. Get a Paperwork Plan consultation with Geri. Subscribe to Geri's concise, and often humorous, monthly blurb on paperwork, process, and keeping life simple.